Do you love the look of the deep crimson padded, quilted pourpoint attributed to Charles VI of France? Have you noticed that most people’s re-creation attempts don’t really come close to the look of the original or the figural imagery of the late 14th century? Do you wonder how to make one correctly? If your answer to any of this is “yes”, I published a paper on this garment which will provide answers. It is in Waffen- und Kostümkunde, a German journal devoted to the study of historical arms, armour, and clothing. The paper, called “The Tailoring of the Pourpoint of Charles VI of France Revealed” is in English and provides an extremely detailed look at the construction techniques used on the original, along with the exact pattern used and measurements which you can use to create a version for yourself. I had the unprecedented opportunity to take this garment off its mannequin at the museum and study it in-depth. I provide never-before-seen photographs which show details that have not been published anywhere by anyone before now. New as of November 16, 2015 – Click here to see the full Charles VI pourpoint article! Perhaps you are wondering why I published in a German journal? This journal has a long and distinguished reputation in the arms and armour community, and in addition to that, it also covers topics of historical costume. The format allows for copious color images too, something most academic journals in print today will not or cannot accommodate. My paper contains 11 color images and 9 black and white diagrams in addition to text, tables, end notes, a bibliography, an acknowledgement list, and an abstract in German. You can order a copy from the publisher, but there is no secure web form for that purpose. You will have to either send your credit card information in an email, preferably broken up into several emails for security purposes, fax it, or send a snail-mail letter containing that information. As far as I know, credit/debit card is the only payment method the publisher will accept internationally, aside from a bank transfer, which will cost you a lot more than the journal itself, so I don’t recommend it. The cost as of 2013 was €17.80 per copy, with €4.20 for shipping one copy. Total: €22.00. You may need to consult a conversion calculator to find out what that costs in your native money format. 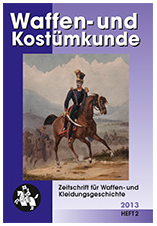 Request the 2/2013 edition of Waffen- und Kostümkunde. Provide your credit card number, expiration date, the security code (the three digit code on the back of your card), and the name as it appears on the card. If you are concerned about sending such sensitive information through email, you can always split the information up over a series of emails. Beyond that, I believe you will have to trust the integrity of the publisher/distributor. Write a letter to the address below requesting the 2/2013 edition of Waffen- und Kostümkunde. Include all pertinent identifying and credit card information described above. From the US, you will need to dial “011” first, then 49, then the rest of the number. Enjoy your copy! I certainly enjoyed learning about lost medieval quilting and sewing techniques for the first time, and it is my pleasure to pass this on to others with the same interests. I am not receiving any financial remuneration for this work. I was just compelled to write the kind of paper I frequently wish existed.